Ever since seeing the Facebook friendship map and later, the map of scientific collaboration, I’ve been looking for an excuse to play with great circles. So I thought, why not come back to Aaron Koblin’s classic Flight Patterns? 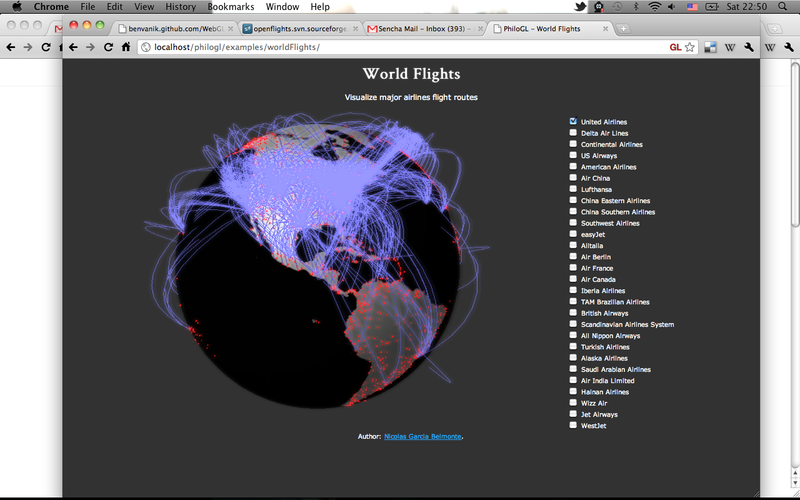 But instead of just looking at all flights (above), I broke it down by airline to see where each one flies. I grabbed the most recent flight data from the Bureau of Transportation Statistics, aggregated by airline, and counted arriving and departing flights between airport pairs. What follows are non-stop domestic flights by major air carriers during February 2011. Brighter lines represent more arriving and departing flights between the two endpoints, and blue lines are the flights with heaviest traffic. Coloring is relative to within the airline as opposed to overall flight count. On a quick glance you can spot where the hubs of each carrier are and flights most often flown. We start off with Southwest Airlines, which flies across the country. There’s a focus obviously in the southwest. Delta Air Lines flies just about everywhere, too, but also includes flights to Alaska and Hawaii. Their largest hub is in Atlanta, which explains the focus at Hartsfield–Jackson Atlanta International Airport. United Airlines, on the other hand, has hubs more north and on the west coast including O’Hare International in Chicago and San Francisco International Airport. It appears they also have flights to all major Hawaiian islands. Lots of American Airlines traffic in an out of Dallas/Fort Worth International Airport and JFK. Continental Airlines looks similar to American Airlines, except Continental’s headquarters are in Houston, Texas. Pretty obvious where JetBlue goes. Despite some delays the past couple of times I’ve flown with them, they’re still my favorite. One time Bill Murray was on the flight. If it’s good enough for him, it must be good enough for me. Mesa is a smaller airline that also operates United Express and US Airways Express. US Airways’ largest hub is at Charlotte/Douglas International Airport. The Alaska Airlines connections look really interesting, streaming out of the the northwest. Most flights go through Seattle-Tacoma International, but there are also flights to and from Portland International. Oh, and of course to and from Alaska. Atlantic Southeast lives up to its name. Hawaiian Airlines looks exactly like you’d expect. They exclusively fly to Raleigh, North Carolina. Ah, I kid. I don’t know where they fly. See how these were made and how to apply this to your own data in this step-by-step tutorial. Why Are Cheap Airlines So Cheap? Awesome. Another cool idea would be to get international flights and map them over a globe to see density and area covered by those flights. I’d use something WebGL-ish like PhiloGL http://senchalabs.github.com/philogl/ to display it. …and here’s the result :D http://i.imgur.com/KLsx0.png . Will be showcasing it at the next WebGL camp @ Google Campus: http://www.webglcamp.com/wiki/index.php?title=Main_Page. Thanks for the link to the dataset. Cool data! Another neat thing to look at would be how the airline networks have changed over time. And not to nitpick, but Alaska Airlines has most of their flights going through Seattle-Tacoma, not Portland. Seatac is their hub airport. @Jon – Doh. You are correct, sir. Fixed. Awesome. For the 2009 ASA Data Expo, I concentrated on a slightly different aspect of airline travel: the incoming or outgoing flights for each airport, colored by delays for each destination. I wish that I had used transparency, like you’re using, because otherwise the lines coming from a hub like Chicago get obscured by the large number of destinations. Nice work Nathan, can you please share the tools that you used? @Misa – I did this in R. Keep an eye out for a how-to some time next week. Very Impressive! How did you create these Charts ? Which software do you use and what data did you have available? Can You give some details about background map You used in those graphs? I am newcomer to maps in R an would like to know how to produce such elegant maps. @grotos – I did use geosphere. Full tutorial coming some time next week. @grotos – I remembered. Very soon :). As most of the airlines are european so that’s obvious that they will fly around europe and america region! Would be cool to see FedEx and UPS in the mix. FedEx in particular is one of the world’s largest airlines by number of planes. @Robert – thanks for sharing! Great concept and thanks for showing. Would be interesting to visualize data on how these same (and other) air carriers fly across oceans and other large land masses besides part of north americ — Canada, Mexico, Asia, Africa, etc.